A website for AddaJet booking engine has been launched by Abakus Solutions. This website was a collaboration between Abakus Solutions and BRNDWGN whereby the latter took care of the design and Abakus Solutions took care of the integration and development of the website for Booking & Co. Ltd.
AddaJet is a powerful, cost effective internet booking engine available in 'Hotel Edition' and 'Travel Portal' edition. 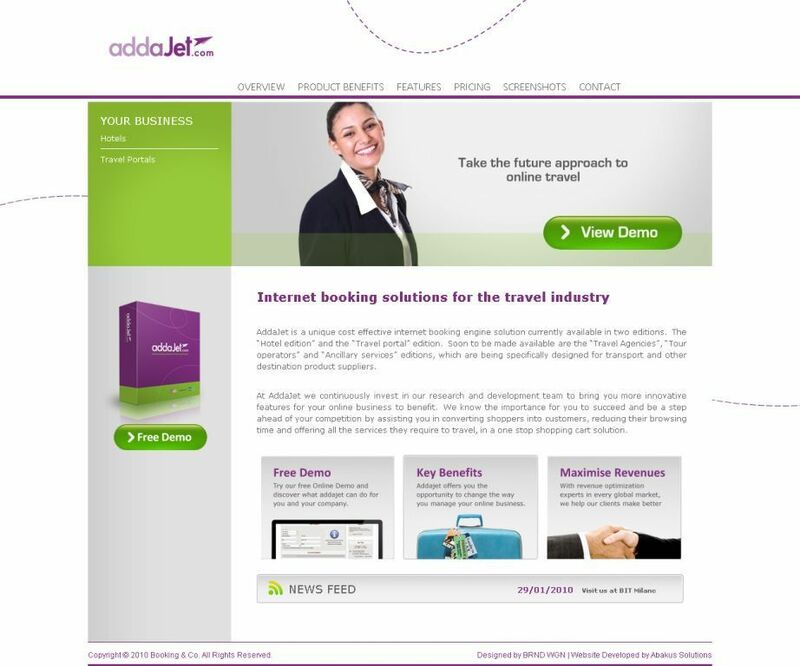 AddaJet 'Hotel Edition' can be integrated in your hotel's website and offer your customers a complete travel solution. The 'Hotel Edition' helps any hotelier in maximizing online revenues, increases up selling opportunities and also direct booking. Hotels will be able to offer Hotel Only, Hotel + Flight, Hotel + Transfers and much more. The 'Travel Portal' Edition helps in increasing traffic to the website and converting more shoppers into bookers, while increasing commissions and revenue opportunities. It also allows travel entrepreneurs to manage their website according to their business needs, strategy and target group. Entrepreneurs can also include their own contracted inventories as well as including additional inventory supplied by several leading accommodation suppliers and aggregators from around the world. Travel Portals will be updated with the best available rates on the market, and mark-ups can be managed on selected destinations. AddaJet.com provides users with screenshots as well as a demo to further explain the features of AddaJet.